Why no to Glentoran and yes to Coleraine? 🤔 Rodney McAree explains his decision to leave Dungannon Swifts for Coleraine after rejecting the Glens in the summer. 🔵⚪️ Good appointment? 👍🏼 or 👎🏼? Coleraine's search for a new manager is over. The club have moved quickly to appoint Dungannon Swifts boss Rodney McAree on a two-and-a-half-year deal. McAree, who turned down the Glentoran job during the summer, is becoming increasingly admired across the Irish League after helping hometown club Dungannon Swifts to their first ever senior trophy in the BetMcLean League Cup last season. He joins a Coleraine side second in the table, three points behind Linfield but with a game in hand. The 44-year-old former Fulham player has been in charge of the Swifts for almost three years and consistently kept the club safe from relegation battles, finishing seventh twice and eighth once. He has been involved with the club almost constantly since joining as a player in 2002. Swifts captain Ryan Harpur admitted the news is a huge blow to the club. “There’s no doubt the boys will miss him,” he said. “We are a very close group and probably even more so since Rodney’s second spell in charge. To lose Rodney as a manager is a huge blow to the club. All the lads are very fond of him. “I can see why Rod has decided to get involved in that and maybe help Coleraine win the league title for the first time since 1974. To be the next manager to bring them a league title is a very appetising challenge for him." Coleraine Chairman Colin McKendry said the club were delighted to secure McAree as their new boss. “He was our first choice and we see him as the perfect fit for our club. He is a winner as he has shown throughout his footballing career as a player and latterly at Dungannon Swifts as a manager," Mr McKendry said. Trevor McKendry, William 'Winkie' Murphy and Paul Owens will remain in charge for Coleraine's game against Ards on Saturday. 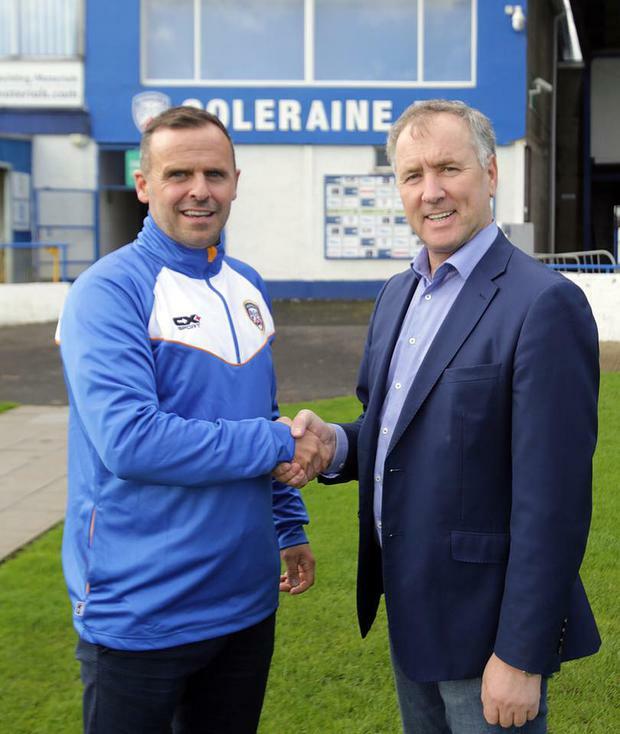 New Coleraine manager Rodney McAree with chairman Colin McKendry. Credit: Coleraine FC and Maurice Bradley.